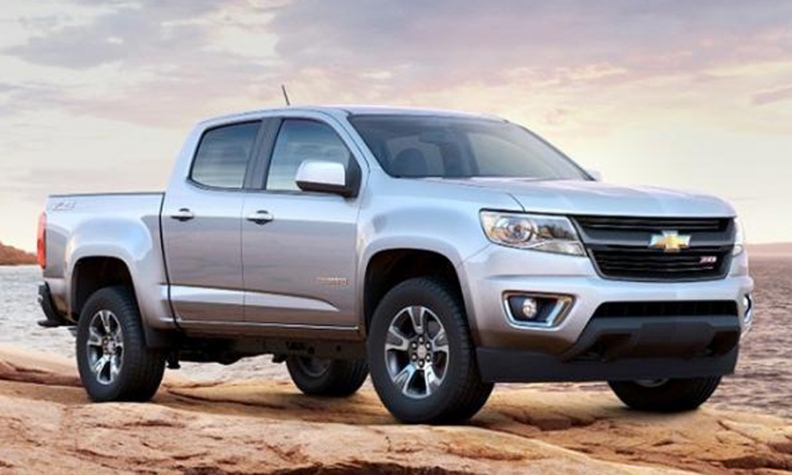 The Colorado (pictured) and Canyon recall covers 48,309 vehicles in the U.S.
General Motors is recalling about 469,000 2011-12 Chevrolet Malibus for a steel cable connected to the seat belt that can weaken and break, along with nearly 53,000 2015 Chevrolet Colorado and GMC Canyon pickups for faulty seat frame attachment hooks. The Malibu recall -- the largest for GM so far this year -- covers 437,045 vehicles in the U.S. and 31,842 vehicles in Canada, Mexico and territories. The flexible steel cable that connects the seat belt to the vehicle in the affected Malibus can wear and separate over time as passengers make seat adjustments, the automaker said in an emailed statement. GM knows of 36 claims and one minor injury linked to the defect, but is not aware of any accidents or fatalities. Owners of recalled Malibus can bring their cars to dealerships for inspection and replacement of the lap pretensioner, if needed. The Colorado and Canyon recall covers 48,309 vehicles in the U.S. and 4,620 vehicles in Canada. About 13,000 of the vehicles are in U.S. dealer stocks, a GM spokesman said in an email. GM said it is not aware of any crashes, injuries or fatalities stemming from the defect. Seat frame attachments in the 2015 Colorado and Canyon may not have been properly attached to the vehicle body during assembly, GM said in the emailed statement. If the part was improperly attached, the front of the seat may not remain secured to the vehicle in the event of a crash. Dealers will inspect affected trucks to assess whether the seat frame attachment hooks need repair. GM recalled a record 27 million vehicles in the U.S. last year in the wake of a safety crisis caused by defective ignition switches, which have now been linked to 100 fatalities. General Motors is recalling 48,309 2015 model year Chevrolet Colorado and GMC Canyon midsize pickup trucks in the U.S. because certain seat frame attachment hooks were not properly attached to the vehicle body during assembly. Dealers will inspect the potentially affected seats for proper installation and repair if necessary. GM knows of no crashes, injuries or fatalities related to this condition. The total vehicle population of the recall is 52,930 including 4,620 vehicles sold in Canada. General Motors is recalling 437,045, 2011-2012 model year Chevrolet Malibus in the U.S. because the flexible steel cable that connects the safety belt to the vehicle can fatigue and separate over time as a result of occupant movement in the seat. Dealers will replace the outboard lap mounting bracket to relocate the tensioner slightly rearward. Dealers will inspect the cable and, if necessary, replace the lap pretensioner. GM knows of 36 claims, no crashes or fatalities and one minor injury reportedly related to the condition. The total vehicle population of the recall is 468,887 including Canada, Mexico and exports.